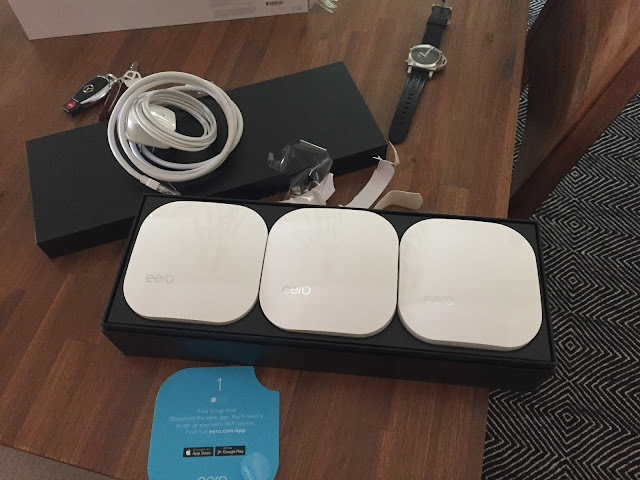 If you need a new router or an upgrade - Buy The Eeros! They are fast, easy to setup, and very stable. You can buy one and add an additional unit at any time in the future if you need to increase your coverage. The mobile app is clean, simple and contains all the features the average user needs. The has done a fantastic job rolling out new features and performance improvements via the in app upgrade process. 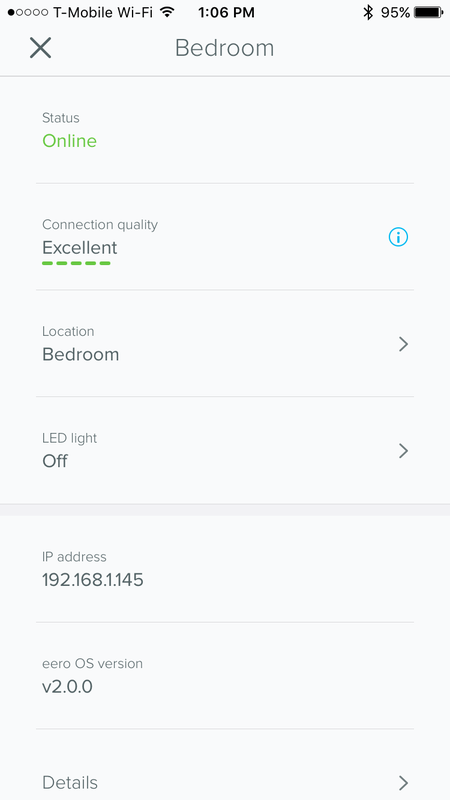 A quick summary of features: High Speed WiFi, Automatic WiFi Meshing, Primary and Guest Network, Device Profiles (pause wifi for the kids easily) and high level network monitoring all via their beautiful app. Good news - 1gbps fiber has been installed to my home. Bad news - my favorite access point / router combination couldn't keep up. Worse news - my favorite access point / router was just discontinued - meaning no more security patches. That is right folks, Apple has decided to end of life the Airport Extreme series. With a large white obelisk in hand I was forced to search for a new access point route to fill my house with WiFi. Must be able to sustain >500mbps routed traffic. Must be be the core product of the producing company. Frequently companies release a product to capture a given market segment and fail to provide software updates, as this product will be the perimeter and core of my network, I would like more than one or two software updates for it. It must be able to support WiFi mesh, I have a disconnected garage that I use for an electronics workshop and Gym(laundry drying facility), I need the ability to provide fast enough WiFi to download files and watch HD movies. It should not require any of my day job skills to setup. I work in technology during the day, I do not want to play system integrator when I get home. If we strike the last bullet point (easy to setup/manage) there are a lot of consumer and small business devices on the market that are up to the challenge, but if we include the last bullet point there are only two - eero and Google's. Unfortunately Google has a bad history of killing consumer hardware with little or no warning as such I cannot consider a device from Google. 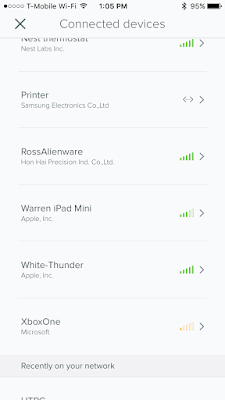 My option than are try these new eero access points or look at some of the SMB products. I am quite glad I was able to give these eeros a shot. Garage is about 20ft from the house. The house was built in the 1930s, as such it has thick plaster walls. The house is a traditional cottage design, which has many small rooms and a maze of walls. It was built way before the concept of large open space planning was a trend. The media PC in the front of the house is used to stream HD movies. The XBox one is used to stream HD movies. 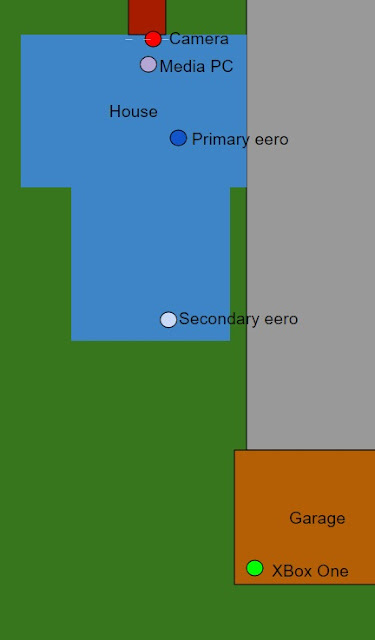 The primary eero is located where the old WiFi Router used to be, in a closet with all my server gear and fiber router. The secondary eero is located in the back bedroom. 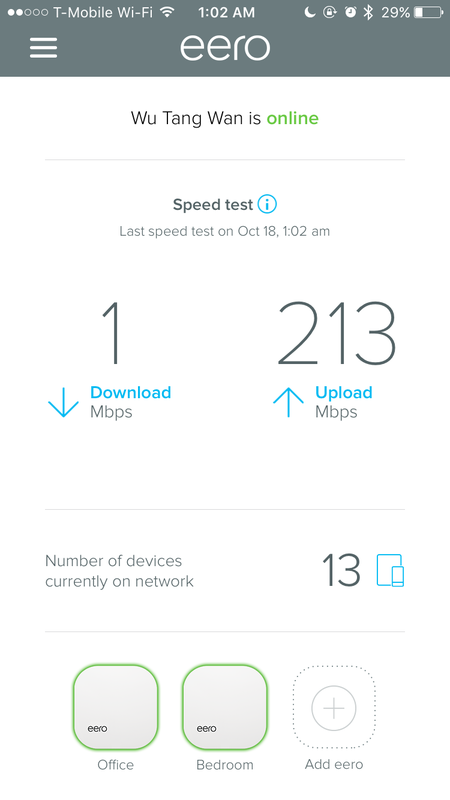 All tests were conducted on 1.X eero software, I need to retest with new 2.x firmware. All tests were run three times, against three unique speed test servers, whole number averages were taken. 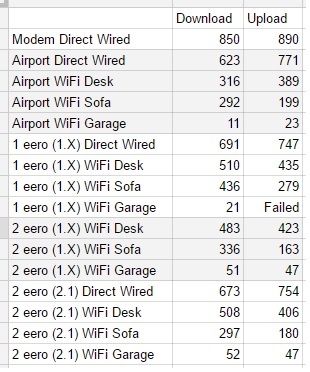 A single eero provides faster WiFi than an Apple Airport Extreme which is 6x the size, with the exception to the garage. 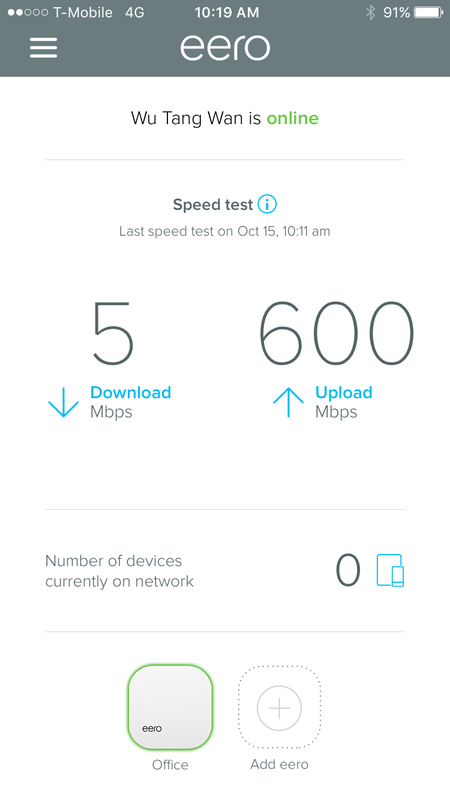 A single eero failed to provide a stable/usable connection to the garage. 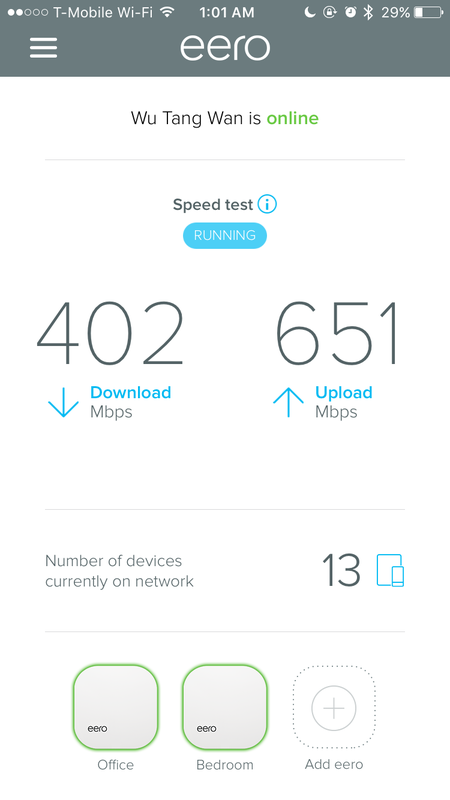 Adding a second eero to the network slows down the primary network slightly (I assume this is because of auto balancing power levels and an increase to the noise baseline in the house due to more radios in use. Not surprising. 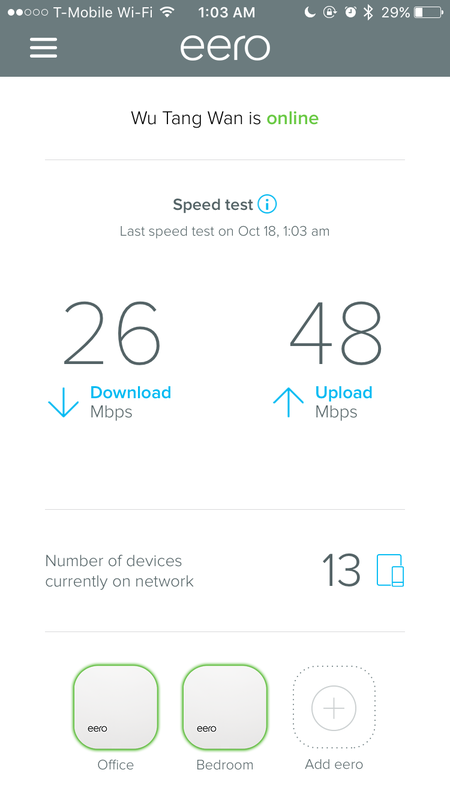 The eero backhaul works amazingly well, they actually seem to do the right thing 90% of the time. 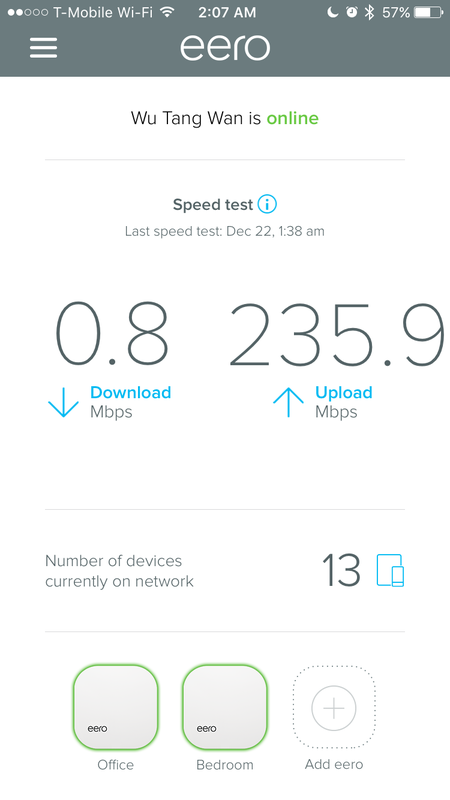 Neither the Airport Extreme nore the eero could NAT traffic fast enough to saturate my link. It should be noted the tests with the 2.1 firmware and 1.X firmware were NOT under identical test conditions. There are two additional devices on the network (camera) and a steam link (near HTPC), these devices both utilize network time and add radio noise. Application is beautiful, stable and a good balance of features. The packaging is very easy to open, I really love the frustration free packaging. The units are nice, small and simple. 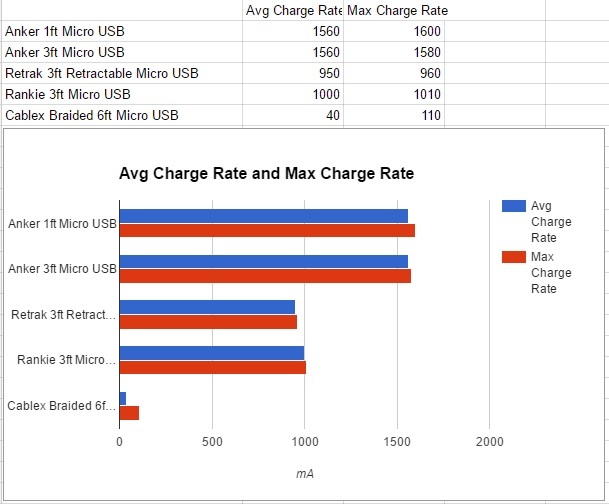 The power supplies are small and self contained, no sizely middle of the cord power brick here. My iPhone's WiFi calling performs well and will roam from access point to access point without dropping the call (as of 2.X firmware, did not work well under the old 1.X firmware). This is something even the newest, more expensive enterprise gear struggles with (I'm looking at you Meraki...). The individual units perform at or above similarly priced consumer devices on the market (linksys, netgear, Apple Airport Extreme (current)). Automatic mesh and network extension actually works. Ability to push guest network to guest users via mobile app (no more post-it note on fridge). (Updated in 2.0 firmware) - Added the ability to software turn off lights on units. 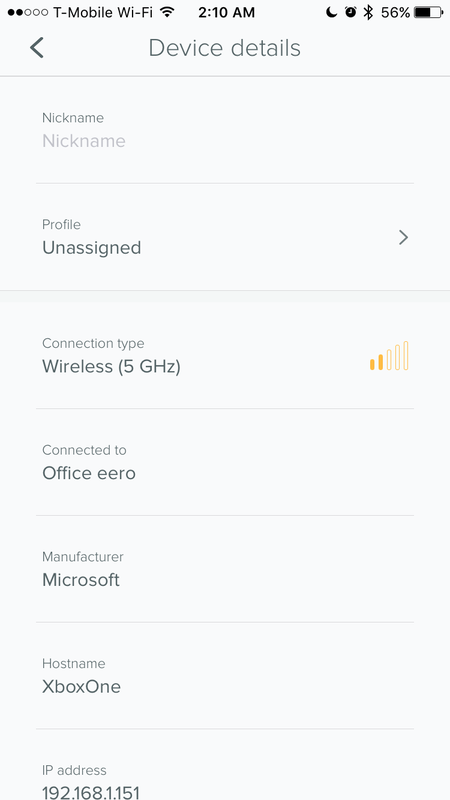 (Updated in 2.1.0) - Ability to see which access point a device is connected to. 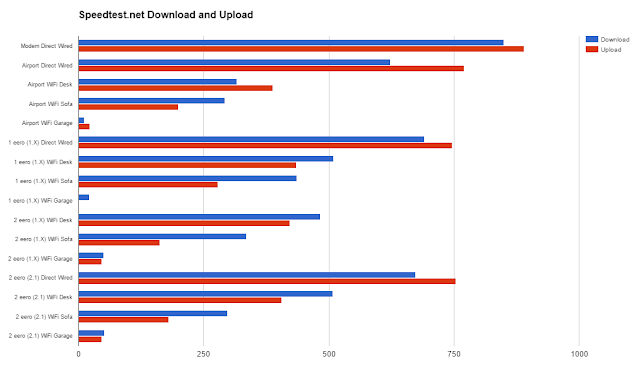 The built in speed test feature that runs daily is highly inaccurate and provides inconsistent performance results. 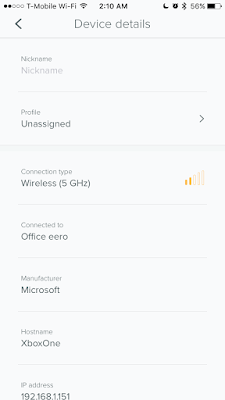 Occasionally some devices associate with the wrong AP for no apparent reason (xbox in garage frequently connects to the network on the Primary eero and not the Secondary eero). Fixed/Added in version 2.0 firmware Ability to disable an access point's light (ie if one exists in a bedroom) when in normal operation. In contrast to this, the network ports do not contain status lights, during installation it was uncertain if they received link state or not; after thinking about the light pollution problem, I am OK with these not existing on the ports. Alert for a new device/host joining network. 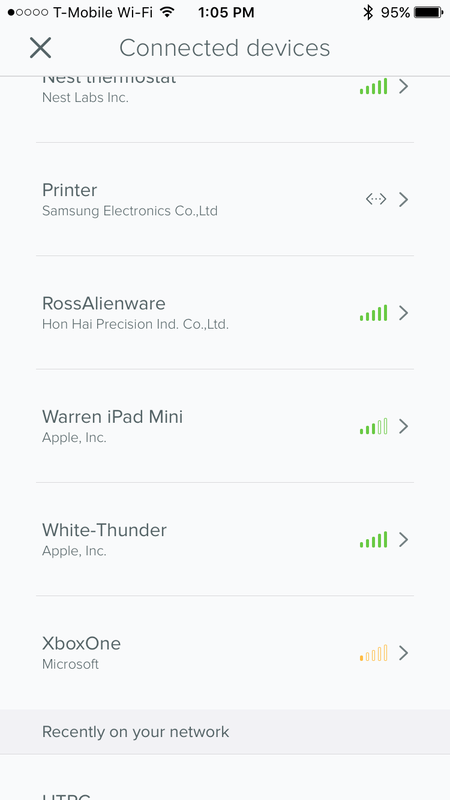 Fixed/Added in version 2.1 Ability to see which devices are connected to which access point. Ability to pin a device to a specific access point - I have a device that is located all the way at the edge of my Wifi coverage yet it still sometimes seems to connect to the center/primary access point instead of the mesh node that is 60% closer to it. Ability to pin certain devices to a frequency. My outside surveillance cameras do not need 5.8ghz, but I find they are constantly switching between 2.4 and 5.8 - when this happens the 5.8 is too weak to reliably broadcast video, hiccups and fails back over to 2.4. During this time the video feed is broken and the auto quality adjustment goes wonky(technical term). To be honest this may be a stupid request, I haven't dug into the 802.11 spec in a long time and this may not be possible while adhering to the IEEE WiFi spec. Monitor traffic usage of devices / profiles - graph device data using historically values pushed to cloud. Possibly alert to new trends (Did my IoT device suddenly start using 500% more data, maybe it has made friends with a botnet). I like to use the guest network for my IoT devices; if they become an IoS device this will prevent them from being able to attack my internal resources, however I dislike having to reprogram them if I want to rotate the network key. It would be great to be able to have a guest network but also grant a temp key to ephemeral users (IE dog sitter). When first setting up my eeros I noticed there were a bunch of hidden SSIDs related to their MAC address. At first I thought I was onto a security flaw, but after much poking around and contacting their engineering team my query was laid to rest. To this date I have yet to find a security flaw in their application, authentication or features - well done eero! If you are lucky, they will be in stock at Amazon - I am not the first person to discover how awesome these things are and as such they have gone in and out of stock during this holiday season. Which is great news because that means eero is here to stay! Wow what a thorough review! Your house layout looks very similar to mine with similar materials (mine was built in 1933 and has lathe-and-plaster walls). This sounds like a great upgrade for my gig service.